Precision Structural Engineering Inc., (PSE), provides design and engineering services for manufactured homes that are more efficient and meet HUD/FHA guidelines. Manufactured housing built according to HUD and FHA standards play a vital role in meeting the housing needs of the nation. Manufactured homes, built to HUD specifications, provide a significant resource for affordable homeownership, and rental housing that is accessible to all Americans. PSE: Design for Manufactured Homes, according to HUD. Manufactured homes and prefabs are homes pre-constructed on a steel frame and transported to the home site. As designs improve, and the integration of selective green building practices are further utilized manufactured homes, factory built homes (FBH), and prefab homes are fast becoming a viable option for many residents. PSE, a leader in engineering for more efficient, higher performing structures, remains dedicated to making advances in this sector of the market by meeting both the consumer demand and building requirements on local and national levels. The design and engineering of today’s manufactured homes is a more intense process than in years past. With advances in green building technologies, manufactured homes provide the ideal platform in both materials and building practices used to integrate new materials. Designing manufactured homes with higher standards of quality makes them more efficient. The offsite construction feature of manufactured homes places them among the most earth-friendly housing options. At PSE, we design our manufactured homes in conjunction with the foundation design, and location to ensure the final project is cohesive. Contact us for a free initial consultation, where we can discuss your ideas in greater detail. A national HUD Manufactured Housing Program was established to ensure the safety and health of those living in manufactured homes. PSE executes all design plans for manufactured homes with adherence to this program. HUD also has guidelines for the foundation design that the home will sit upon. It is necessary to produce evidence of compliance certification from a licensed engineer to obtain insurance on the home. For FHA insurance, a manufactured home must carry a one-year warranty and meet the FHA Model Manufactured Home Installation Standards. PSE engineers can ensure that your ideas and specifications will adhere to these guidelines. Home sites must also meet FHA standards. These standards include water supply and sewage disposal parameters. PSE can help homeowners meet these requirements, and incorporate the greenest and best performing systems in their manufactured homes. For more information on manufactured housing, local guidelines, or HUD/FHA criteria, contact PSE at www.structure1.com or 541-850-6300. Any manufactured unit that will be used for commercial application must have an engineered foundation plan stamped by a licensed Engineer. The requirements for residential manufactured homes vary state by state; please call the building department where the manufactured home will be built to ask about their requirements. “Permanent Foundations Guide for Manufactured Housing” , HUD- 0077487, US. Department of Housing and Urban Development. Manufactured Home Installation Training Manual. U.S. Department of Housing and Urban Development Office of Policy Development and Research. The most basic requirements for installing a HUD-Code home is to simply follow the manufacturer’s instructions. Most of these instructions depend on the tie-downs for lateral stability. 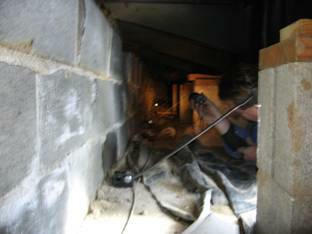 However, in order to comply with HUD, all tie-downs must be anchored into site built reinforced concrete footing. Please note that most manufacturers allow the tie downs to be anchored to the soil, which HUD does not approve unless the tie-down can resist the required force when the soil is wet or saturated. Ordinary tie-downs using ground anchors are the usual protection against sliding force. However, soil anchors are not a permanent foundation for HUD projects. No permanent perimeter reinforced masonry stem wall or structural attachment between the stem wall and the house are required, as long as the tie-downs are installed. In my opinion, this guide is complicated and not easy to follow. This is because it allows several methods to achieve the permanent foundation objectives. However, if we concentrate on the most common methods, such as tie-downs and regular foundations like the one we used for site built homes, the guide becomes very beneficial. Especially, it can be used by any qualified person, and not necessarily a licensed engineer. 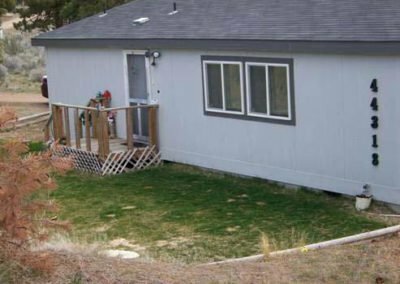 Along with the above guide, there are several excellent books that explain more how to design a permanent foundation for a manufactured home. Please see the list of references below. When a Permanent Foundation is Required? The owner has a loan from HUD, Department of Housing and Urban Development. The owner has a loan from a bank that requires a permanent foundation. Method 1: Furnished foundation drawings and design calculations prepared and sealed by a licensed professional engineer. Method 2: Furnish the design Worksheet (Appendix F, Design Worksheet) prepared by a license professional in accordance with the Handbook. NOTE: Method 2 does not require design calculations. NOTE: Methods 1 and 2 both require submittals of Appendix E (Owner’s Site Acceptability & Manufacture’s Worksheets) As PSE often times inspects an existing house, a letter of inspection indicating that the foundation complies, or does not comply with HUD requirements is acceptable. Rated anchorage capacity to prevent uplift and overturning. 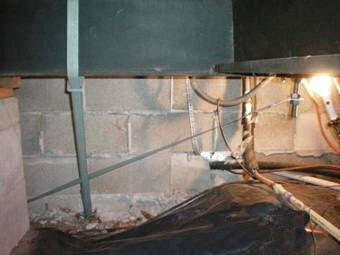 Enclose a basement or crawl space with a continuous wall that separates the basement or crawl space from the back-fill, and keeps out vermin and water. Total anchorage capacity to prevent sliding due to wind or seismic forces. 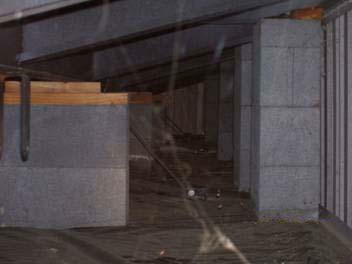 Anchoring systems connected to the top in Wind Zone I and II, or bottom in Wind Zone I of the chassis beams to the concrete foundation of the stem wall at the bottom end. HUD considers this to be permanent if the anchoring system is connected to the soil at the bottom end by means of soil anchors. Specific spacing per manufacturer and/or as required by calculations. 2 feet from the beginning of the Chassis beams. The anchoring system shall be connected to the concrete footing of the stem wall. 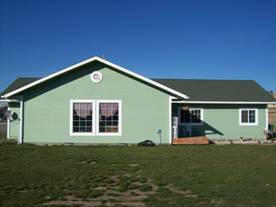 See page 68 of Manufactured Home Installation Training Manual for straps criteria and diagrams. 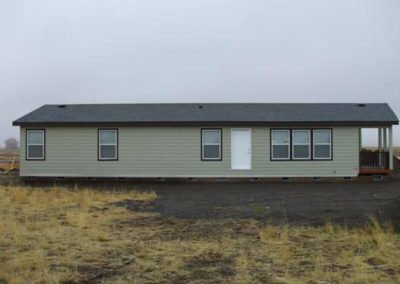 According to HUD Code, page D-2, “the manufactured home unit, single of multi-wide is assumed to be a box with a flexible floor and roof diaphragms. End walls and selected interior shear walls were assumed to transfer lateral forces based on tributary area methodology.” The unit’s wall location must closely coincide with the foundation shear walls or vertical X-bracing planes. A structural engineer shall design the system if there are devotions from these assumptions. Tie-down systems—the most common and the most economical system. 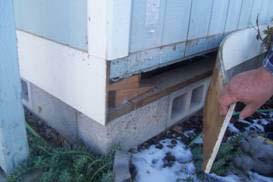 Reinforced masonry stem wall–skirting, system that is tied to the home. In addition to the above, an alternative pre-engineered system could be allowed. See alternative construction below for pre-engineered systems. Notes: Tie-downs to resist wind/seismic forces in the longitudinal direction, installed along the short/cross side of the home. Tie-downs to resist wind/seismic forces in the cross/short direction, installed along the long side of the home. Refer to S4.0 for details. 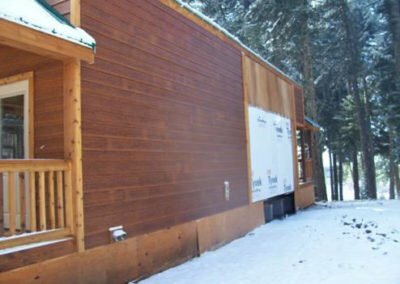 Piers are required at each end of an opening, such as at windows and doors, as well as at 6 feet on centers along the four sides of the home perimeter, if non-structural skirting is used. 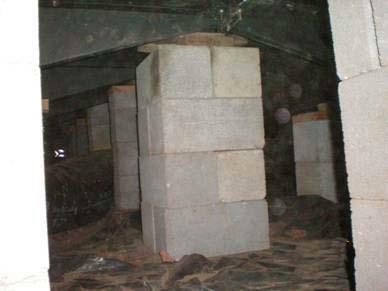 Install single stack masonry piers- manufacturer’s recommendations are usually at 6 feet on centers. 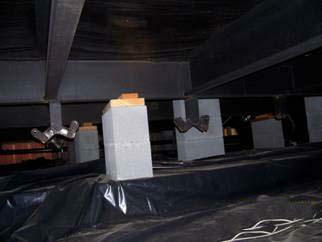 Install double or triple stacks of masonry piers at each end of the opening more than six feet. Assume that the slab does not have enough steel to act as reinforced footing, plain concrete. Also, assume that the pressure line wall goes in a 45 degree downward cone shape from the edges of the pier base to the soil through the concrete slab. As such, to calculate the pier capacity, add one thickness of the slab to the pier base dimensions on each side. Then multiply by the soil bearing capacity to the pier capacity. The pier usable capacity will be the smaller of the two values above. 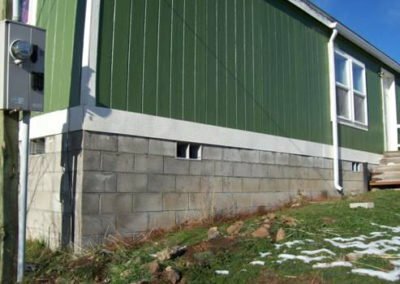 Please note that having a concrete masonry stem wall at the perimeter of the house does not constitute as a permanent foundation. Site built reinforced concrete footing under the stem wall and the concrete slab runners under the interior piers. Both the bed joints and head joints are filled with mortar. Building paper and siding to protect the strip. A pre-fabricated and pre-engineered load bearing wall, which has approval from HUD. (It is similar to the ICC report, but from HUD instead). You must get the technical information from the manufacturer of the pre-fabricated walls. It must state that it is a load bearing wall and not just a skirting. The foundation for piers must be of reinforced concrete. See section 503-2. (Do this only for new construction, not for inspection of existing foundations). The minimum thickness for a pier is 8 inches. The minimum thickness for pier footing is 8 inches, or 1 and ½ times the length of the footing projection from the pier, whichever is greater. Reinforce footings when the projection on each side of the wall, pier or column exceeds 2/3 of the footing thickness or when required due to soil conditions. HUD requires the foundation for the stem wall go below the frost depth. However, more depth may be required to add more weight to the foundation in order to resist uplift forces and over turning forces. 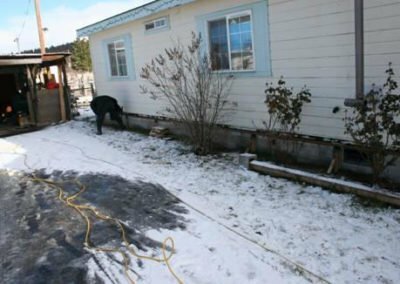 If the foundation is not extended below the frost depth, we can add rigid insulation outside the foundation to reduce the frost depth. International Residential Code, IRC chapter 3. Design Guide for Frost-Protected Shallow Foundations by HUD, 1994. Frost-Protected Shallow Foundations in Residential Construction, Phase I by HUD, April 1993. 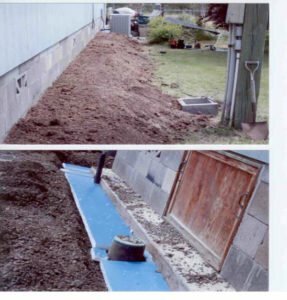 Frost-Protected Shallow Foundations in Residential Construction, Phase II, Final Report, by HUD, June 1994. 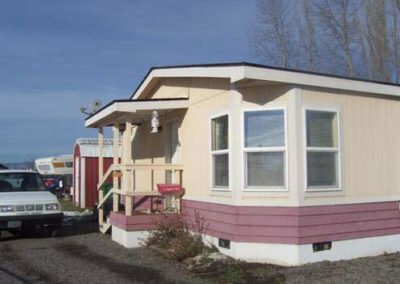 66-60-1 General State of Oregon has a Code that regulates the foundation for manufactured homes. “Oregon Manufactured Dwelling and Park Specialty Code”, MD&P. However, HUD, when required by the loaning institution, is applicable to all States. HUD, when required by the loaning institution, is applicable to all states. Type C: A foundation system supported and anchored at the chassis only, to equally spaced piers. Type E: A Foundation system supported at the chassis and exterior wall but anchored for uplift and overturning at exterior wall only. Type I: A Foundation system supported at the chassis and exterior wall, but anchored for uplift and overturning at exterior piers only (This is at the outside chassis beam, not at an exterior wall). Because the weight of the home is usually not evenly distributed over the supports, homes tend to rotate during earthquakes, putting a severe load on a few outlying piers. HUD Code Section 3802.306 states that all homes “when properly designed and installed will resist overturning and lateral movement”. 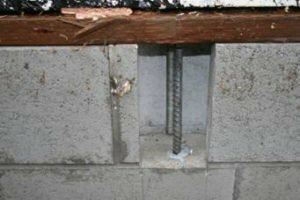 All homes need to either be tied down to properly installed ground anchors, or installed upon a foundation that is engineered to resist the loads specified in the HUD Code. It is NOT possible to resist the wind load requirements for any wind zones by simply setting a home on a stack of concrete blocks. Ground anchors will not work in saturated soil. HUD requires the anchor to be at least 12 inches above the water table. 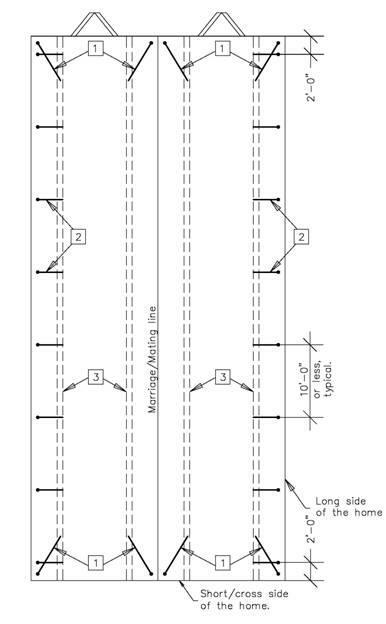 HUD requires a vertical tie at each angled tie for houses in Wind Zone II and III, p 68. 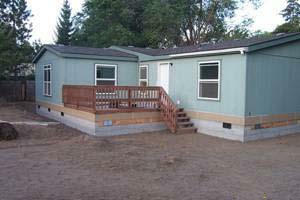 Modular homes: For modular homes, please click here. Permanent Foundation Guide for Manufactured Housing (HUD-007487) Code dated September 1996, U.S. Department of Housing and Urban Development, HUD. Oregon Manufactured Dwelling Installation Specialty Code, 2010. 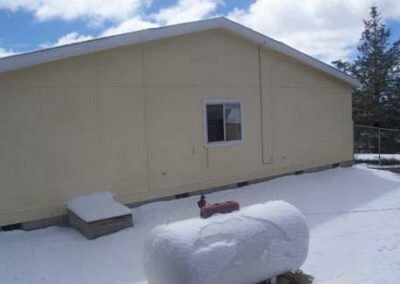 Manufactured Home Installation Training Manual, U.S. Department of Housing and Urban Development, HUD, Office of Policy Development and Research. Next Generation of Manufactured Housing Design Phase, U.S. Department of Housing and Urban Development, HUD. Design Guide for Frost-Protected Shallow Foundations, U.S. Department of Housing and Urban Development, HUD. Frost-Protected Shallow Foundations, Phase II, Final Report, U.S. Department of Housing and Urban Development, HUD. Moisture problems in Manufactured Homes, Understanding their cases and finding solutions by Manufactured Housing Research Alliance. Guide to Foundation and Support System for Manufactured Homes by Manufactured Housing Research Alliance. 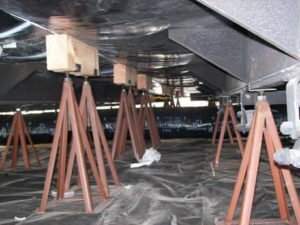 Guidelines for Anchor System Design: Technical Support Document by Manufactured Housing Research Alliance. Factory and Site-Built Housing. A comparative analysis by U.S. Department of Housing and Urban Development, HUD, Office of Policy Development and Research. Manufactured Houses, Finding and Buying Your Dream Homes for Less by A.M. Watkins.